Okay, so technically it's not July 4th yet. But it is Monday, and we're getting in the theme of things here. When I think of food on July 4th, I think of barbecue or burgers or hotdogs and corn on the cob with watermelon for dessert. So we did a lunch of veggie barbecue ribs (the ones by Morningstar Farms - I had one in the back of the freezer to use, and they are delicious! 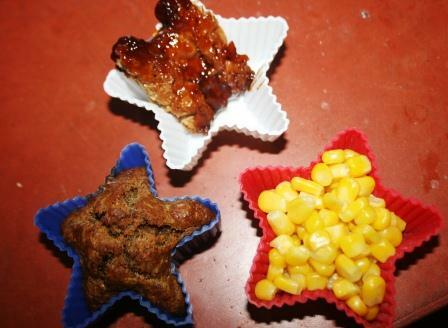 ), corn, and a sweet potato pecan spice muffin. This is the first time I had ever baked in these star cups, and Pierce thought it was so neat when he popped out the muffin and it was star shaped. What food do you associate with July 4th? These muffin cups are adorable! Independence Day favourites at Blether House? Hmmmm, fresh sweet corn right off the grill and red white and blue fruit salad are probably the top two! That very cool! !!!! Have a great day! What a wonderful lunch! It would be perfect for the 4th of July! Those look great. I love the stars! Any typical cookout food always reminds me of the 4th, hamburgers, hot dogs, corn on the cob and potato salad. I always get so nostalgic, especially since I'm usually working that day. Everything sounds and looks so good. I really am drooling over that muffin! That muffin soun ds real good. My sis used to make a sweet potatoe praline pie. Veggie barbecue ribs? I've got to look for those! I think of hot dogs, potato salad, watermelon and fresh tomatoes. Watermelon is one of my favorites for July 4 - that, and home made ice cream, curned by an old tractor motor! We go to Jugville every July 4, and they have antique tractors of every shape and kind, and a wonderful meal at their festivities on Robinson Lake. Great country music as well! I can't believe it's nearly the 4th of July already! Your muffin tin meal pretty much sums up my idea of the perfect 4th of July dinner. Barbecued burgers, corn, watermelon, and maybe a rhubarb pie! I like those star shaped cups. Anything on the grill represents July 4th to me! So cute! Those look like the perfect size for me for portion control. Love it! We're grilling burgers. I make a Southwestern burger that has feta cheese, cilantro, smashed beans and other things in it. I think it's good. We'll have a salad and watermelon with it. I bought stuff to make S'mores. It's not something I normally make, but we're making a fire. I think the kids will like the treat. These are adorable -- and I take it you got your power back on? I'm not sure I have a particular food that I associate with the 4th. I wonder why! Beer! Oh, you said food. Just kiddin'. Looks delicious, Lisa... I always think of picnic-type foods on the 4th --including WATERMELON... This year we are taking lunch to see G's dad and sister.. We'll take fried chicken, baked beans, potato salad, and deviled eggs... YUM!!!! I love the idea of putting food in the little shapes. Just the right serving size. Love it!